No, that’s not a typo, though this futuristic lamp does have a satellite-like design form. A creation of the Anon Pairot Design Studio, it is constructed using spot welding and hundreds of woven 0.5 millimeter steel rods. The copper-colored, geometric orb is one of many Anon Pairot designs that feature a pattern reminiscent of traditional Thai textiles. Formed in Bangkok in 2007, Anon Pairot Design Studio is focused on solving “unique design-challenged circumstances,” as well as engaging in sustainable practices. In addition to being an artistic design studio, the firm is also a creative and strategic design consulting firm. Mr. Pairot was born in Thailand and has a background in mechanical engineering and industrial design, both of which are evident in his work. He is also passionate about his Thai heritage, a design style he felt was undervalued. 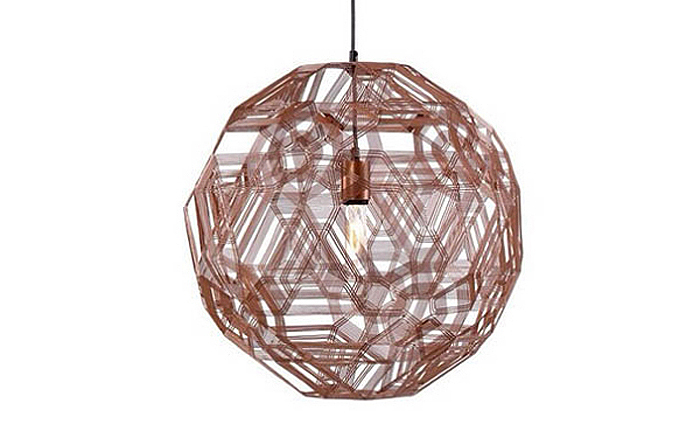 In fact, the handweaving of the Zatellite Lamp is done by local Thai artisans. Add to the mix the fun pattern the light is sure to cast on your wall, and this lamp is one great conversation piece.